Razer Snake Gaiters are light-weight (each gaiter weighs only 13 ounces) and are uniquely contoured to fit around your calves. A toe cover protects the laces of your boot. This means you have 12 inches of snake bite protection (approximately knee to ankle) with an additional 5 inches of protection over the top of your foot. 1000 denier nylon cordura covers polycarbonate inserts to stop snake fangs, cacti needles, briars, thorns, sticks, etc. 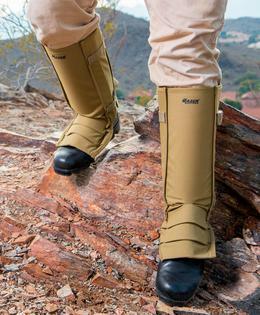 Gaiters also help keep your pants clean and dry. 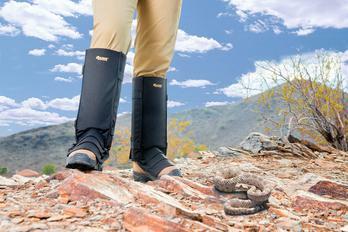 Always wear snake gaiters over pants and with thick boots that fangs cannot penetrate. One size fits most! 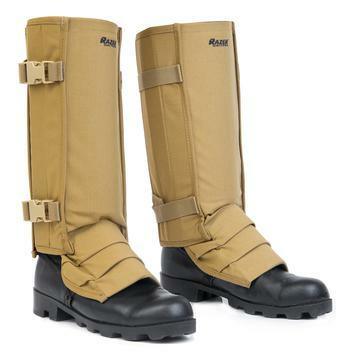 Razer Snake Gaiters are adjustable and will fit calves 13 to 20 inches in diameter. Measure around your calf while wearing pants. Available in black, tan, and camo. Each pair comes with a FREE black nylon storage bag. LIGHT-WEIGHT & DURABLE: 1000 denier nylon cordura covers polycarbonate inserts to stop snake fangs, cacti needles, briars, thorns, sticks, etc. Each gaiter weighs only 13 ounces — a pair is 1 lb, 11 oz. FORM FITTING & COMFORTABLE: Unique design of 13 polycarbonate panels offer protection— 1 large center panel to protect the front of your lower leg, plus 12 narrow panels (6 on each side) that smoothly wrap around each calf. Tighten straps and buckles for comfort. ONE SIZE for MEN & WOMEN: One size fits calf sizes 13-20 inches when measured over pants. LAB TESTED for SAFETY: Tested to ASTM F1342-05 Puncture Resistance of Protective Clothing Test Standard and ASTM D5420-16 Falling Weight Gardner Impact. Click here to view lab certifications. 3 year replacement warranty for defects in materials. FREE nylon storage bag with locking drawstring cinch cord! Razer gaiters ARE available to ship outside of the USA! Please purchase through our listings on eBay. 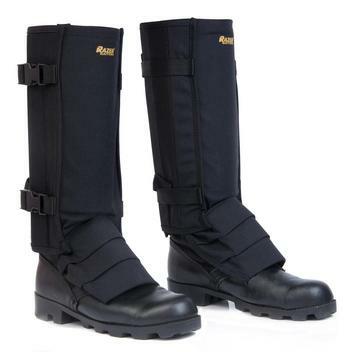 Click here for international orders of black gaiters. Click here for international orders of tan gaiters. 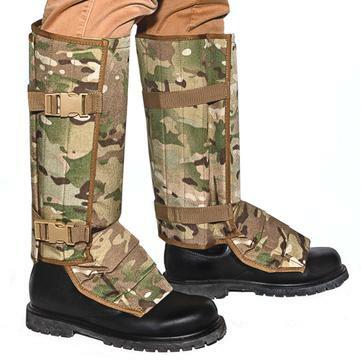 Click here for international orders of CAMO gaiters. Click here to view lab certifications. Watch Razer Snake Gaiters being tested on LIVE SNAKES!